With a width of 72-inch and an elegant design, the Andover bathroom double vanity is ideal for your master or large guest bathroom. It has a rich dark cherry finish with decorative carved flourishes, and features a matching mirror to pull the look together. Quality craftsmanship is evident in this unit, as zero-emissions solid oak hardwood was used to reduce environmental impact, prevent warping and last for many years. A 12-stage process was also used, including preparing, painting, sanding and hand-finishing. 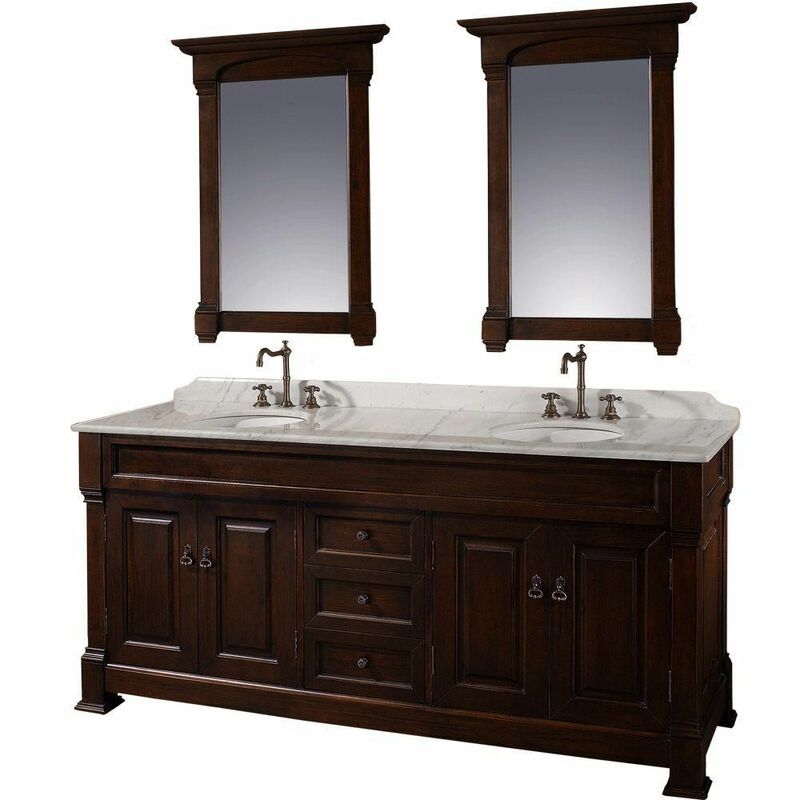 The Andover 55-inch solid wood bathroom vanity offers generous counter and storage space. It was finished in dark cherry and features a contrasting Carrara white marble vanity top and white sink for a seamless and timeless look. This unit was constructed using environmentally friendly oak hardwood and following a 12-step hand-finishing process to achieve stunning and trouble-free looks, and performance for years to come. The size and elegance of the Andover 60-inch double-sink vanity make it perfect for your master bath. It features a rich cherry finish and decorative carved flourishes, and includes a matching mirror to make a statement in your space. This vanity was constructed of zero-emissions solid oak hardwood to prevent warping, reduce environmental impact and last for years. To ensure the quality of the material even further, a 12-stage process was used on the wood, including preparing, sanding, painting and hand-finishing. With its contemporary yet classic design, the Audrey 72-inch Vanity in Espresso with Double Basin Marble Vanity Top in White Carrera with White Basins and Mirror will look perfectly at home in either a traditional or modern bathroom. Zero-emission solid oak hardwood construction prevents warping, reduces environmental impact and ensures the Audrey will last for years to come. Soft close doors eliminate slamming and keep the tranquility of your bath. Andover 72-inch Vanity in Dark Cherry with Double Basin Marble Top in Carrera White and Mirrors With a width of 72-inch and an elegant design, the Andover bathroom double vanity is ideal for your master or large guest bathroom. It has a rich dark cherry finish with decorative carved flourishes, and features a matching mirror to pull the look together. Quality craftsmanship is evident in this unit, as zero-emissions solid oak hardwood was used to reduce environmental impact, prevent warping and last for many years. A 12-stage process was also used, including preparing, painting, sanding and hand-finishing.